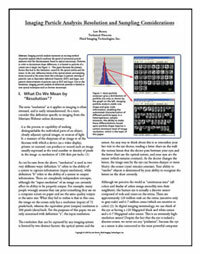 The ability of an imaging system to resolve details in a particle is essential for accurate measurement. Therefore this technique is optimal for counting particles 1 micron and larger, and characterizing particles 2 microns and larger. This paper discusses how the optical system and the sensor of an imaging system affect the ability of the instrument to size and characterize sub-visible particles. Sampling considerations for optimal results.